Is your New Year’s Resolution to get your life organized? Perhaps you’re tidying up your home, inspired by Marie Kondo and her life-changing KonMari method. When you get organized and declutter your home that creates piles of unwanted stuff that needs to be donated to the thrift store. With every donation that you make to Volunteers of America thrift stores, you are giving hope to families, veterans and individuals in need. 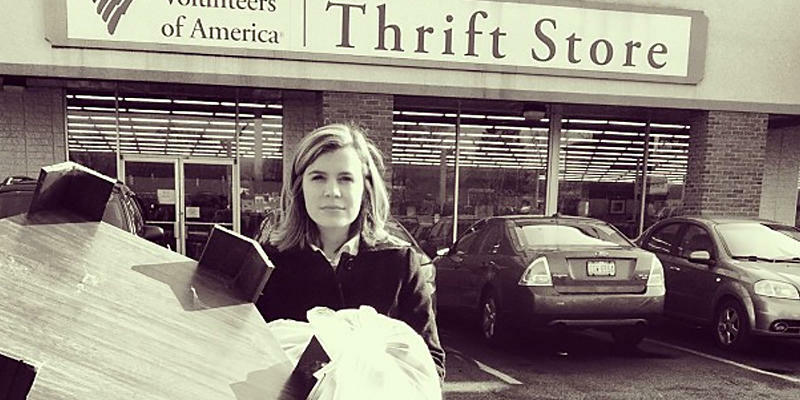 Your stuff is sold in our thrift stores and the revenue is used to fund our community programs across Ohio and Indiana. 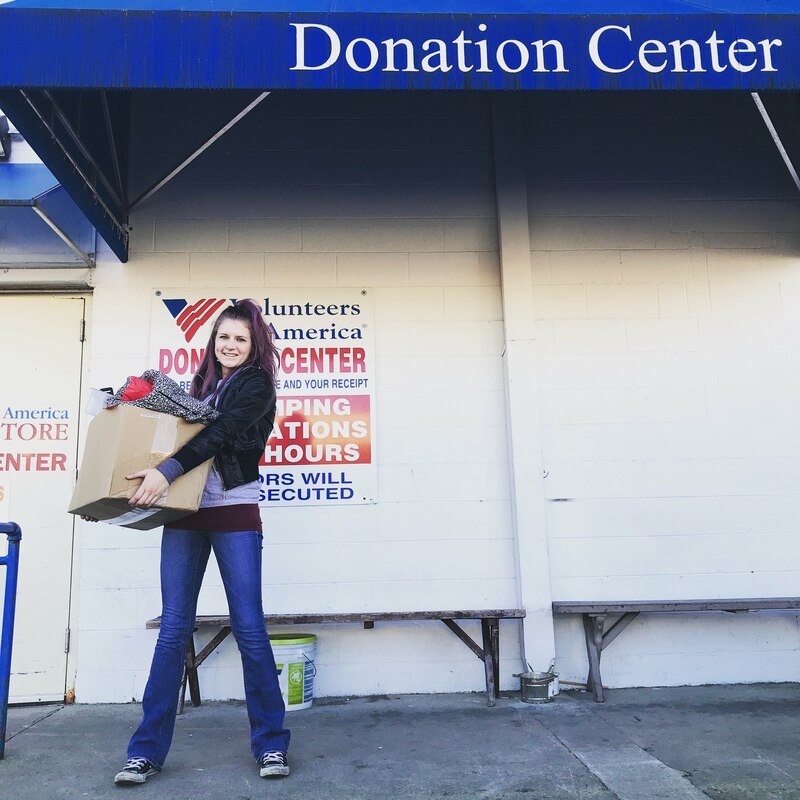 Thank you for donating your items to Volunteers of America, a 100% non-profit thrift store. Toss them in the laundry one last time before donating them. This will ensure the clothes are clean, fresh smelling and ready to be sold in our thrift store. Double check that you’ve removed any coins, business cards, receipts, keys, notes or important items from your clothing. Once donations start going through our sorting process, it becomes hard to track them down again. So, as much as we would love to find a $20 cash donation in one of your pants pockets, make sure you check your pockets. Keep shoes as a pair by tying shoelaces together or putting a rubber band around the shoes. We need both shoes in order to sell them in our thrift store. Have you ever seen just one shoe for sale in any of our thrift stores? Now, that would just be sad. If you’re donating a TV with a remote, be sure to tape the remote to the TV so it stays together. The same goes for video game systems or other electronics. Keep all pieces together. Pay it forward to the shopper who will buy your TV and give them the remote. If you’re donating a set of dishes or like items, pack them in the same bag or box so they arrive at our donation center together. Y’know what they say, dishes of a feather, flock together. You can help us out by sorting your donations into two easy categories: Clothing and Household Items. Place all your jeans, shirts, socks, dresses, linens, and anything that has fabric into one bag. In the other bag, place the kitchen, household and miscellaneous items. Bonus points for labeling your boxes or bags! This will help us when we sort your donations. Place jewelry like necklaces and bracelets in individual bags so they don’t get tangled up together. Nothing is worse than a big ball of tangled up jewelry, right? Mark on the box if items inside are fragile. We don’t want any of your stuff to be broken! Before you load up your car or contact us to schedule a free home pickup, check our list of items that we do pickup and our list of items that we do not accept. Note that we’re not able to accept donations of certain items like mattresses, pianos, beds, chemicals, or large appliances. We also can’t accept broken, hazardous, toxic or recalled items for safety reasons. Examples of these items include old paint, cribs, car seats, or fire extinguishers. When we receive donations of items that we don’t accept, we have to spend money properly disposing of those items. This means, less money to help veterans in our community. Scheduling a home pickup is the best way to avoid driving around for weeks with your old stuff in trash bags in your trunk. We’ll pick up your donations, no problem. Schedule your free pick-up by calling us at 1-800-873-4505 or emailing us at askthrift@voago.org. Be sure to leave your items out in a spot that’s visible to our truck drivers. You can leave your stuff on the curb, on your porch or any spot that a driver would easily be able to see. We can pick up anything on our list of accepted items that one man can lift. 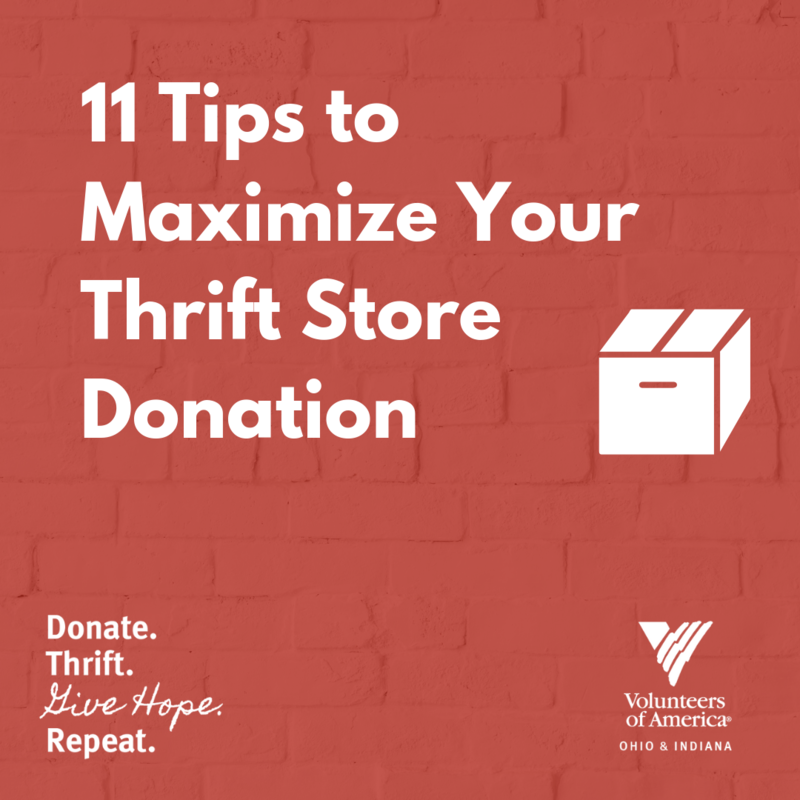 When you drop off your donations at one of our thrift store locations, be sure to ask an employee for a donation receipt. This will come in handy if you choose to itemize your taxes and would like to deduct your donations. Tip: Take a picture of your items before you donate them. Show your tax professional the picture for help in determining the value of your items. The value of your donations depends on the specific items and their condition. Be sure to use the current fair market value to determine their value. The IRS has a handy guidebook to help you determine the value of your donated stuff. 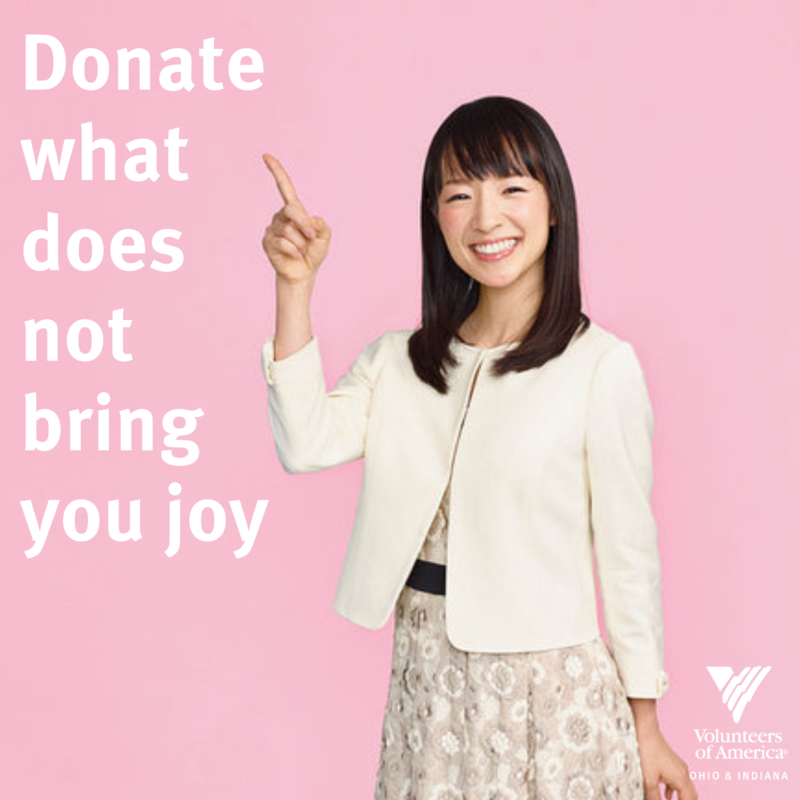 When you donate your stuff to a non-profit organization like Volunteers of America, you can easily help your community thrive. So clear out your closet, find a Volunteers of America thrift store near you, and do your part to make your community a brighter place.